Sprox is a widget generation library that has a slightly different take on the problem of creating custom web content directly from database schemas. Sprox provides an easy way to create forms for web content which are: automatically generated, easy to customize, and validated. Sprox also has powerful tools to help you display your content the way you want to with table and record viewers. Sprox provides a way to fill your widgets, whether they are forms or other content with customizable data. Well, that’s a mouthfull! Sprox provides a bridge between database schema and the forms you want to customize for the web. Sprox has an IProvider, which basically tells sprox how to interpret data extracted from the database manipulation library. Sprox comes packaged with a provider for SQLAlchemy. It is important to understand that Sprox expects that the database manipulation library will have a unique way to map database objects to table schema. The mapped objects are often referred to as models, in Sprox, these are called entities, because Sprox has abstracted the manipulation of table and field schema to the point where they interface other parts of the system in a similar manner. SQLAlchemy’s Object Relational Mapper provides a basis for many of the examples in this documentation. Here is the Model used in this documentation. Notice first that we have made three fields required set the order, and omitted the fields that we do not want in the form. Also, we overrode the widget type for email_address and display_name (The default was a text area). 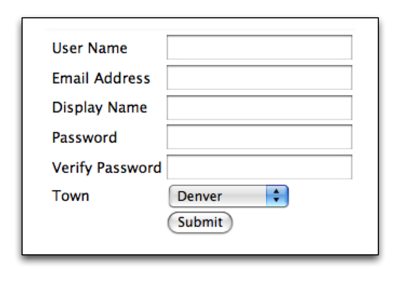 Lastly we add a verify_password field that is not in the current schema. Also keep in mind that if you were to alter the schema for your database, any fields you added to your User model would also be added to this form. If you wanted to avoid this, you would use __limit_fields__ instead of __omit_fields__. There are many other __modifiers__ for FormBase in Sprox, you can use them to generate the forms you desire in any number of combinations. For more information see sprox.formbase and sprox.fillerbase. Keep in mind that since the form generators are declarative, you can use mixins and other class trickery to reduce your code further (although it is not advised to use this to fool your fellow developer). Can you think of a way to reduce the 14 lines of python code above to 8? In reality, Sprox is not about making your code smaller, but making it _smarter_. Since you have a declarative base to work from, you can subclass a set of widgets that fits your application. You can provide customized widget selectors which tell Sprox which widgets to use for which fields. Because Sprox gives you the power to customize any part of the form at any level of abstraction, you can create your own form generation based on the requirements for your project. Here are a couple of tutorials that express the most common ways sprox is used. It is recommended that you have some knowledge of TG2 when looking them over. Sprox has the ability to hook any widget library or object mapping library into it’s shoestrings, but as of this time Sqlalchemy and ToscaWidgets are the supported libraries. Sprox is an open source project, and can be found at bitbucket. If you have a great idea of how to make sprox better, feel free to fork off your own copy and send a pull request. Sprox is licensed under the liberal MIT license. This means you can do what you want with it. Include it in your own package, sell it for a profit, modify it for your needs. We really don’t care how you use it, but it should be noted that preferential support is given to those consumers who give back to the open source community, participate in Sprox development and help us find and solve those pesky corner cases. This documentation is generated partly from doctests within sprox, which you will find througout the module-level api documentation. This means that the docs you see here are in a known working state before release, and should stay that way, even as development progresses. Even the trunk will have it’s tests executed before commit, so that should remain stable with respect to the docs. The examples you see through out these docs are all based on an example model which is also used throughout in testing.